I’m a big fan of storytelling. I’ve been doing it ever since I convinced my second grade class that Susan Lucci was my birth mother. So when I heard that Scranton would soon have its own StorySlam, I was very excited. Started by Abington Heights Senior, Madeline Zoe McNichols, StorySlam is an homage to New York City’s legendary storytelling series, The Moth. Participants must tell a TRUE story in five minutes or less. What you get, is a blend of memoir, performance, poetry, and laughter. 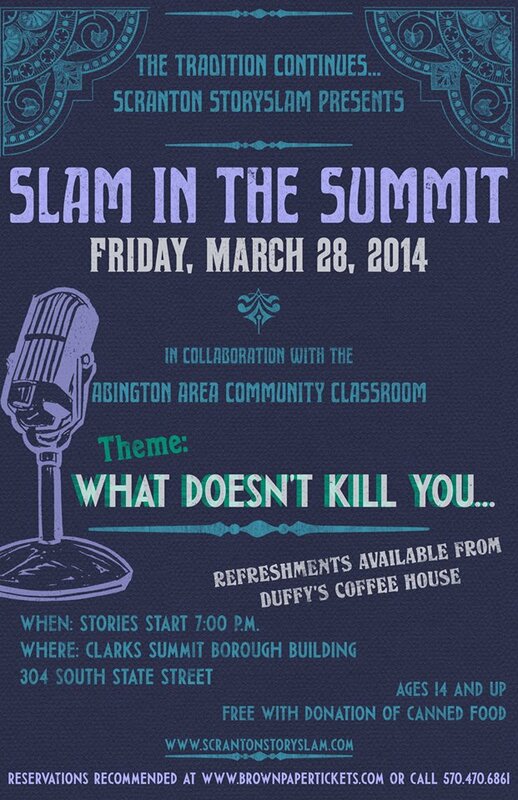 Tonight, University of Scranton’s, Dr. Michael Friedman, will be taking the stage in Slam in the Summit: What Doesn’t Kill You. Come out and show your support for Dr. Friedman and all of the storytellers! 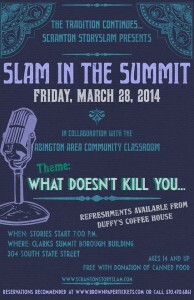 What: Scranton StorySlam Presents: Slam in the Summit. Theme: What Doesn’t Kill You. Cost: Admission is free with the donation of a canned food item. Wow, Amye. You’re the best. Thanks for posting about the event and helping to get the word out. Dr. Friedman was SO good. He was funny and engaging. When his story is available on video, I’ll be sure to send you the link!